Female ladybugs lay their eggs on the underside of leaves. This is to protect them from being seen by flying predators as well as from the weather. A mother ladybug will lay from ten to fifteen eggs in one place and she will make sure that it is a place where the babies can find food when they hatch. The ladybug eggs look similar to yellow jellybeans, except that they are tiny. The next time you are in the park in springtime, carefully look under some plant leaves and see if you can pick out some ladybug eggs, but don’t touch them because you could kill the babies. 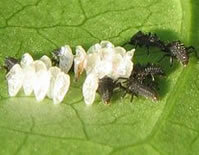 Once the eggs hatch, the larvae will come out and start looking for something to eat. 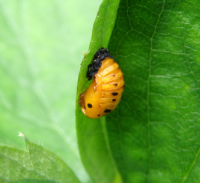 They will look for tiny mites or aphids and they should find plenty because the mother found the perfect leaf to lay her eggs under because of the abundance of food for the larvae to find. Newborn larvae look sort of like tiny alligators. 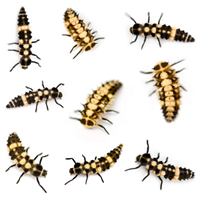 After only a few days, the larvae will be large enough to begin to molt (shed their skin), and they keep molting for as long as they are growing. You can find the molted skins on leaves if you look very hard. What does a newly emerged ladybug (one that just hatched out of the pupa) look like? Visit www.ladybuglady.com/NewLadybug.html to see one emerge step by step. When the metamorphosis is complete, the skin of the larvae will split open and the full grown ladybug will emerge, but it still won’t look like the ladybug that you know so well. It will look soft and pink or very pale for a couple of hours until its shell becomes hard. 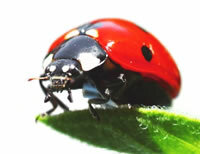 As the shell hardens it also gains pigment, which causes the ladybug to become bright red.